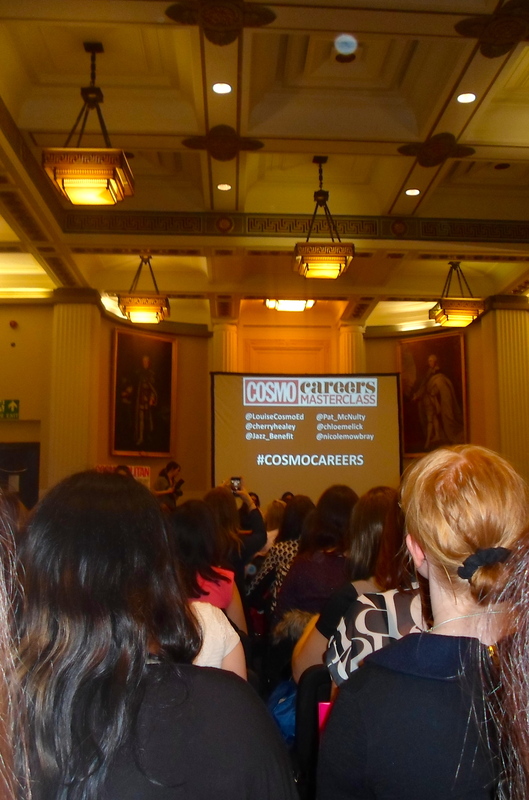 As loyal readers of Cosmopolitan magazine when we heard about the ‘Cosmo Careers Masterclass’, which was held on tuesday night in Freemason’s Hall, London, myself and Sarah Redman decided we HAD to attend. They all mesmerised us with their top tips for getting into the industry. They firstly discussed the pros and cons of working in the media with Cherry stating how the job comes with having to deal with both the glory of doing something spectacular for all to see, but also the pain, ‘if you make a mistake it is open for the whole nation to see.’ Pat stated the fact that the industry at times is ‘exhausting’ and you have to be able to ‘think on your feet’. The panel explained the importance of first impressions to an employer. A well written cover letter and CV is essential! Chloe said how important it is to ‘do your research’ so that you know more about the company. For example, if applying for a magazine who is their audience? What sort of articles do they write and in which section? Nicole gave a great tip that when applying for a position why not give examples of perhaps features that you would like to write and state which section they would be suited to ? This gives the editor or whoever is reading your application less to do while they prowl through the hundreds of emails all applying for a similar role. By showing that you have already thought about your capabilities in the company, is sure to go in your favour. As many of you may be familiar with, when applying for internships you have to broaden your horizons and apply for multiple places as clearly there is a lot of competition. The panel explained how you want to show your keen, but obviously do not want to come across as a stalker! Nicole says if you have sent ‘two emails and have not heard back then your out’. Nicole says her record of emails from the same person was a jaw dropping ‘seventeen emails over six weeks’. All the panel agreed that there is ‘a line’ and although you want to show willing and be persistant, we have to be careful not to over do it! Chloe highlighted that ‘networking is key’. It is essential to make contacts as you never know what opportunities this may bring in the future. Jazz said that her ‘last three jobs have all been through someone I knew previously… it’s all about your reputation in the industry, the world of media is not as big as you may think’. Word of mouth can either be your friend or enemy, so the panel stated how key it is too make a good impression. When interning Cherry said it is ‘all about atmosphere’. Cherry stated the clear fact that when interning you are there to help out with whatever tasks may be thrown at you. Cherry said, ‘you want a bright face and just say I’m gonna fix this for you… get there early and stay there late’. The industry is competitive enough and to get the chance of interning we have to grab it with both hands, and make sure we have a Cheshire cat smile spread on our cheeks at all times. The debate of whether a degree is worth it was a significant topic of conversation which as always is a fairly controversial topic, especially since the fees have rocketed! The overall feeling for degrees seemed to be that it does give you an advantage especially as more and more people go to university these days and so it is harder to be offered the same opportunities without one, as on paper as a degree often gives you that edge on somebody else. Louise said a degree provides, ‘a chance to grow up and gives you time to do placements and build up your experience’. Jazz stated that a degree is a good idea, ‘especially if you know what you want to do, but people also look for personality. It’s about having skill and common sense. By doing a degree it proves that you can meet deadlines’. By attending this event I feel much more confident when applying for placements, as I now have a better understanding of what employers are after and so thought you guys would also be interested in these top tips! Pat also mentioned how good Bournemouth’s Multimedia Journalism course was at Bournemouth University, which definitely made myself and Sarah Redman feel proud to be apart of a well thought of course. The session highlighted how important experience is and gave many of us the boost and confidence to push ourselves that bit more, in the hope of getting our dream job in the industry.